Acqualagna is a town of some 4000 inhabitants settled between the two hills of Gola and Furlo in the province of Pesaro Urbino, in Le Marche. It is one of the most important centers for the production and commercialization of truffles or ‘tartufo’ in the whole of Italy and the annual festival is one of the most important in Italy. The industry developed in this area thanks to a benign climate where the truffles can be harvested all the year round. As a result, Acqualagna produces almost two thirds of the entire national harvest. Exports play a big part with Germany, Belgium, Holland, France, USA and Canada the principal markets. Four basic types of truffle are harvested. From January to March it’s the turn of the black truffle (Tuber Melanosporum Vitt ), while April/June sees the collection of the ‘summer’ black truffle (Tuber Aestivum Vittadini) and July to September the white Marzuolo truffle (Tuber Albidum Pico). The final three months of the year sees perhaps the most important period when the highly prized white truffle (Tuber Magnatum Pico) is harvested. Like much of Le Marche, the territory of Acqualagna is full of historical remains of incredible interest. Do visit the Abbey of San Vicenzo known locally as the ‘Pietrapertusa’. It dates from the 9th century and was built by the Benedictine monks, then restored in 1271 by the Abbate Bonaventura. The town sits along the Via Flaminia constructed in the third centiry BC and named after the consul Caio Flaminio. A little younger is the ‘Galleria‘ cut into the rocks by the Emperor Vespasian in 76 AD near Furlo. Only in 1995 was a farm discovered dating from the same period. Together with the remains of the Roman municipality, ‘Pitinum Mergens’, it is possible to see close up how daily agricultural life must have been at the time. Do visit the dedicated museum. 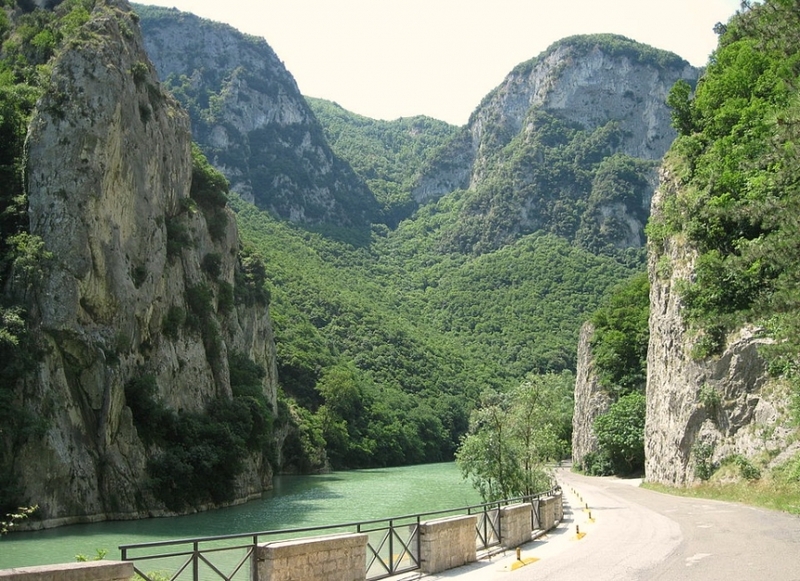 The working of the local stone has remained in the local genes ever since the Furlo Gorge was constructed. Many important works we see today in Urbino originated here and these traditional skills have today transferred themselves to more contemporary designs and needs; kitchens, baths, stoves, fireplaces etc. Follow this link for more artisan crafts in the province of Pesaro Urbino.